OK, so I think it’s kind of obvious that I’m a sucker for great visuals and aesthetics. I am a total slave to “things that look nice,” and so I was suckered into getting the Glossier Phase 1 Set, despite not really needing anything from the set. 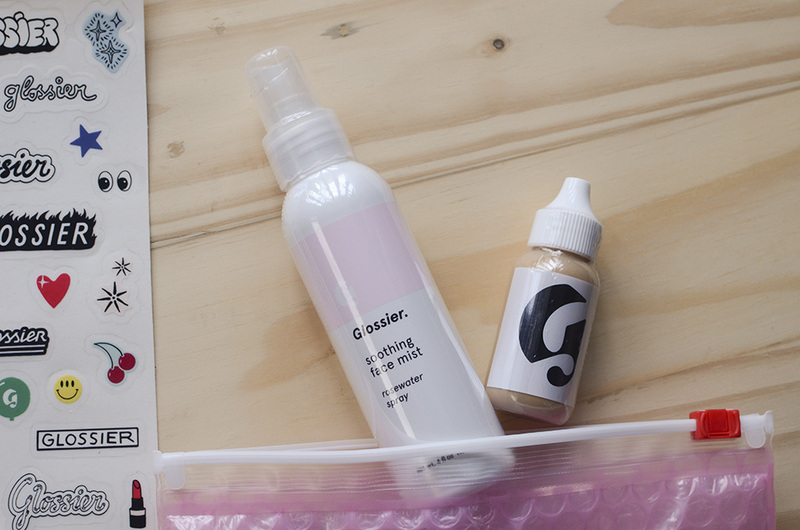 If you are not familiar with Glossier, it’s the off-shoot beauty brand of beauty blog Into the Gloss, which I used to read very regularly. Sidenote, but I find their content a little “off” and different these days. Anyway. 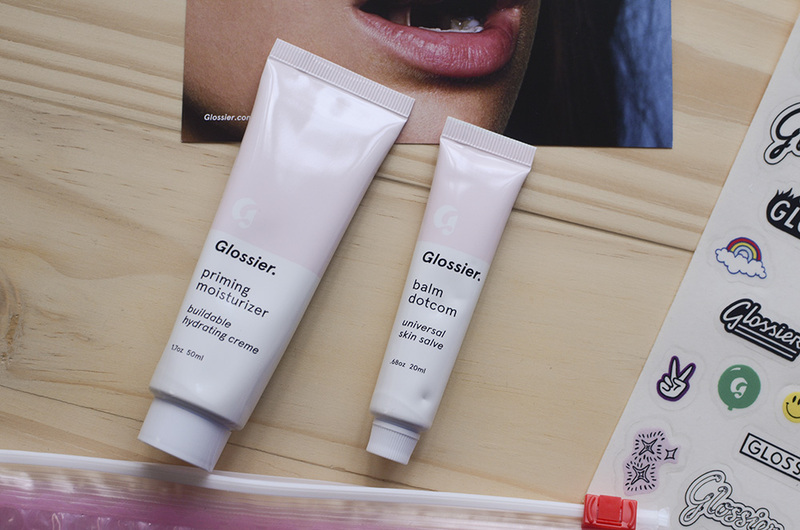 Launched just a couple of months ago, Glossier’s Phase 1 Set is comprised of 4 products: a face mist, a priming moisturizer, a tinted base, and an all-around salve. Despite my disappointment at the fact that “Glossier” is pronounced “glossy-yay,” I went with it, because… well, why not? I’d seen many glowing (and not-so-glowing) reviews and—STICKERS! It looked so sleek and so much fun at the same time. A gif, because half the fun of this experience was the actual unboxing! Though the items can be purchased individually, I went for the set for the “full experience,” like an idiot hoarder packrat. 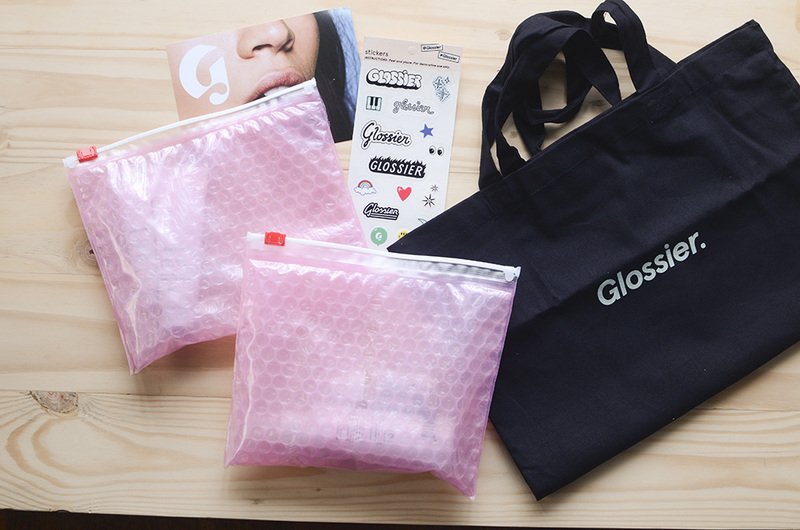 Inside the super cute and sturdy white box are two pink bubble wrap pouches, a sticker sheet, a welcome card, and a free Glossier tote. I’ll pretend it says “Glossy-er” and feel better about myself. The four products are divided into the two pouches. The first half contains the products packaged in tubes, which are the Priming Moisturizer and the Balm Dotcom, a universal skin salve. As far as trying out the products, I was surprisingly very pleased with Balm Dotcom, cringe-y name besides, having used it to moisturize my lips (it stays on and hydrates!) and my torn up cuticles. It works out better for me than Vaseline, though it has petrolatum as its first and main ingredient. I don’t know what that’s about; I’m just happy it seems to be working out for me! The tube is very small. The Priming Moisturizer felt pleasant, and is light enough to use in this humidity. My main gripe is the lack of SPF, but I think this might be my favorite product in here. The next set contains the Soothing Face Mist, which is perhaps the product I’m least excited about, and the Perfecting Skin Tint, which is a very, very sheer base. The Soothing Face Mist is rose-scented and automatically makes me think of a funeral home. It feels quite refreshing (if I hold my breath!) but the spray doesn’t really “mist” so much as “spurt out” the product. The type of sheerness of the skin tint would be great if your skin was already great. It’s a barely-there skin base that aims to bring out natural beauty, but does very little by way of coverage. I think it ties in perfectly with the Into the Gloss overall attitude of effortlessness, but I think it might be alienating for those who prefer a heavier coverage. It’s fixable with concealer if you have “problem areas,” but again, a little limiting. I actually really like the way it looks on my skin, but I don’t tend to go for heavy bases anyway. Again, no SPF. The tubes are designed to be doodled on, like a high school math notebook, by way of stickers. So. Much. Fun. Obviously, I am still in the process of testing these out, but so far, I’m… not hating anything, but I’m also not quite in love just yet. Have you tried Glossier? Are you a fan of Into the Gloss? Not sure how I feel about the stickers… I don’t see many grown women playing around with stickers like this. But the products do look lovely. Hahaha I’m 26 and I had a great time with the stickers. 🙂 I do believe they have a specific market in mind, though, so I know what you mean. I agree with you about the recent change in ITG’s content. I used to be a big fan, but these days the articles seem more shallow and thrown-together. I’ve heard that a few of the founding writers left over the summer, which I’m sure has had an effect. And now that they’ve branched into selling their own products, I don’t see how the site can avoid becoming more like an advertorial than it already is. Blah. Anyway, I’ve been curious about Glossier, so I’m glad to see this review! I’m just going to carry on pronouncing it “glossi-er” in my head. It makes so much more sense that way. Yeah, that’s what I heard, too. Perhaps it’s a deliberate change in direction? I’m curious to see how it’s going to affect content on the site, though it’s kind of obvious that it’s gearing itself toward a more lucrative direction, which I can’t fault it for, but at the same time, I’m sad for the “old” ITG. Anyway! I know, it was such a miss on their part, IMO. I was SO happy about the name, and then I found out how it was pronounced, lol. Anyway, so far I like them but I’m not over the moon. I’m a fan of Into the Gloss and still get a kick out of Emily the Super Intern from “The Hills” being a founder. Curious to see what you think of the skin tint. I’m really tempted by the idea of glowy skin, but I think I’ll be one of those who hates it for having no coverage. Im a big fan of ITG and am curious as to how you meant you find Their new content off, are there any old articles you liked and show the big disparity between old and new stuff? I Kinda like Their new writers like trace barnhill and alexis cheung. Thats totally Fair :)i appreciate your writing and your recommendations and in fact credit you (Among many others) for inspiring me to set up My new blog. I still look forward to your recommendations Every time! Oh and if You get a chance to pop by My other blog id Really appreciate your feedback! http://suchabeaut.WordPress.com 🙂 thanks Carina! Thank you so much 🙂 I can’t wait to read more posts on Such a Beaut! Hmmm, definitely been seeing a lot of buzz around their products. May have to try them myself! How did you order-or did you get in the US?! I still read ITG but not all their posts..yeah, i think it’s trying too much to be too cool (and too much content)! I love the packaging and the specific pink,of the products though but I’m only interested with the tint..looking forward to your review! I ordered from the site 🙂 Yeah, I agree. The content has declined, perhaps from the pressure to post more frequently. They used to have many useful articles and a lot of interesting people to interview, but now I’m not so sure. Cute the packaging, no? From my initial trial, I think I like (not love yet hehe) all except the mist, which I can honestly do without. I love reading ITG, but I also feel like the content is a bit bipolar now. When these came out I was so tempted to order them because I had relatives coming from NY last week but turns out I wouldn’t be getting them as schedules so I was scared it wouldn’t reach me. I hope you do a much more in depth review of these products in the coming months, I’d love to really know what makes it stand out. I am LOVING the stickers. I think it’s a great idea. Are they waterproof? I’d imagine some of the containers getting wet. Hah. What a thing to think about, right. Yep, I will for sure. 🙂 As of right now, I’m not super impressed (they’re not bad, but nothing special), so I’ll definitely be more observant. Not sure why the thrust of Glossier seems to be “skin first,” since these don’t feel particularly good for the skin. I think they’re great, too! They’re kind of made of a plastic material, so I’m sure they’ll stand up to SOME water, but I don’t think they were meant to be permanent anyway, so it’s OK. 🙂 I have my products on my desk, though, so I don’t think I’m going to get them too wet, or at least, I hope I don’t.